I joined Cummings School faculty in 2013 as a research assistant professor and Director of the MS in Conservation Medicine Program. I also assist with the RESPOND project, serve as a Co-director of the Tufts Institute for the Environment, and retain a position with the Smithsonian. 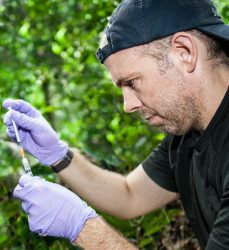 My most recent experiences have included trainings in wildlife health, disease, surveillance, epidemiology, and participatory epidemiology in Thailand, Vietnam and Gabon as well as conducting field research on emerging infectious diseases in rodents in Gabon. I enjoy the mix of research, field work, and training the next generation of wildlife health professionals and feel fortunate to be doing so at Cummings School where our work is done in the context of One-Health and conservation medicine.